In intellectual sparfests these past few days I have faced not a few persons asserting that the citizens of Japan deserve (and, according to Ozawa Ichiro, want) an organized, progressive umbrella party as an electoral alternative to the Liberal Democratic Party. To which I reply, "And what would this alternative party's policy axis be?" 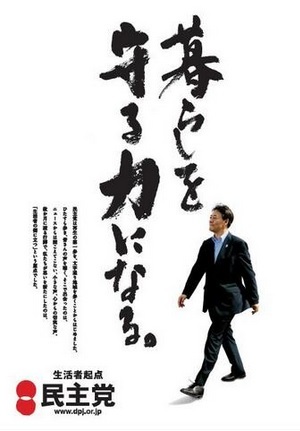 Let us look at the posters of the current five strongly anti-LDP opposition parties, i.e. DPJ - "We Will be the Power to Protect People's Ways of Life"
People's Life Party - "We Will Protect Livelihoods!" DSP - "Rather Than A Strong Country, A Kind Society"
The Party That Loves This Country"
Give the JCP credit for its opportunistic seizure of a national emblem at a time when Mt. Fuji is very much in the news, and for its unabashed expression of a love of country. 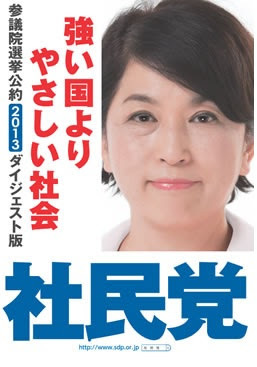 Way to go, JCP (whose name is, by the way, the NIPPON Kyosanto) -- this is how a progressive party should muscle in on right wing nationalist territory! Nevertheless, the similarity of the messages, rather than being a source of hope (hey look, all these different parties are saying about the same thing -- we have the ingredients for a united front here!) is instead incredibly depressing*. 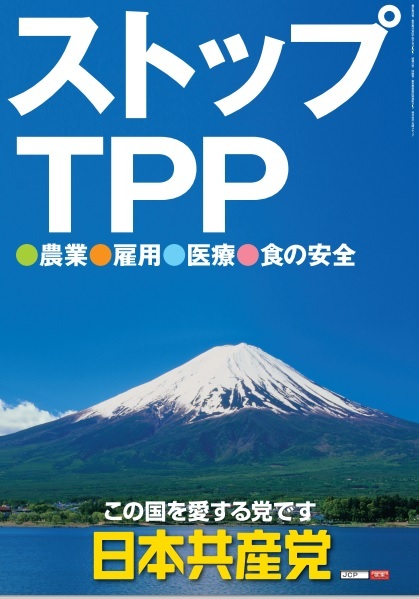 Each party is asserting that globalization and its effects can be resisted, that competition and market forces can be stopped at the border, and that even as the world changes, Japan can stay as it was. I am sorry. If a crabbed, timid and backward-looking vision is what you have on offer, then you have lost me. For all its many faults, the policies of the ruling LDP-New Komeito coalition, which are in every area risky as hell, at least acknowledge the premise that the important work of government is the management of change, not desperate, lunging attempts to keep change out. * That the DPJ, People's Life and Green Breeze should have near identical policy platforms is hardly surprising, as all are led by either Ozawa Ichiro or one of his proteges. I think it's a little unfair to call out all the opposition parties, without mentioning New Komeito's stultifying "安定は希望です" newspeak. High uncertainty avoidance society, anyone? It's funny that post-DPJ, LDP finds itself in the position of being the "change" party. Also, I kind of can't believe that the People's Life Party poster is real. 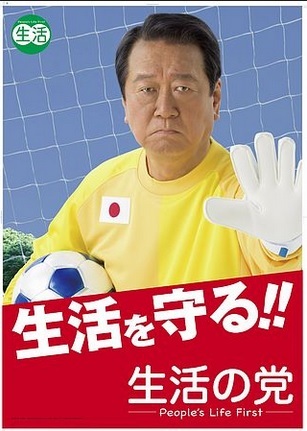 I think the party official who coordinated that photo shoot totally punked Ozawa. I would agree with your criticism, except that New Komeito slogans scream out for readings as allusions to the party's role in coalition government. Antei wa kibo seems to saying to voters "Without us seated in numbers as a part of the coalition, the LDP runs amok and the country is in upheaval. So if you want stability..." An ancillary admonition to show self-control can also be seen as being directed at the LDP.